If you want to see some of the best-loved artwork in Montreal, just look down. Since 2001, the city's streets and signs have been under satirical revision, thanks to local artist Peter Gibson, a.k.a. Roadsworth. At first, he worked like a rogue public-works department, protesting the city's lack of bike lanes by painting his own. 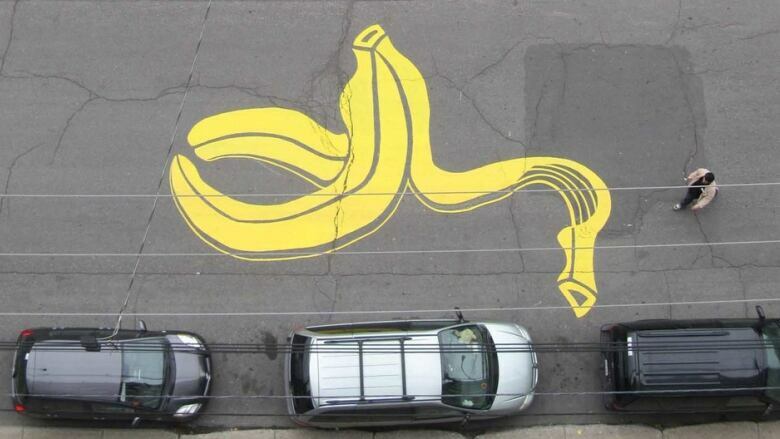 Within three years, he'd left 80+ stencils around Montreal. And the biggest pothole you've ever seen — or "chicken's nest," to use the translated Quebecois slang — might suddenly appear. When you're making people laugh, while potentially wreaking havoc on the already perilous Montreal traffic, you're going to get noticed, and by 2004, Roadsworth found himself charged with 53 counts of mischief. Facing $100,000 in fines, his supporters rallied together. A "Save Roadsworth" campaign was launched, and the artist was let off with a few community service hours — which he spent creating some new public art, of his devising, in the Plateau. At this year's Mural Festival, Roadsworth is on the Montreal pavement again, creating a new piece in partnership with Amnesty International. And home in Quebec, as well. "I'm proud of the fact that I can make a living being creative and doing something I enjoy," he writes, but as the artist tells CBC Arts, there are times when he wishes he could still play the rebel as much as he used to. When he began making adjustments to Montreal's traffic markings, Roadsworth explains he was working more as an activist, one who was protesting the "excessive presence of cars and the noise and pollution they produce, not to mention the infrastructure that's required to support them." "As time progressed," he writes, "my interventions, while activist in spirit, began to take a more artistic direction." His commissioned work often addresses some of the same themes that have inspired him since the beginning — "nature, absurdity, humour, politics, form" — and projects like his most recent work in Indianapolis, have celebrated cycling as a "positive force in cities." Still, he says, "something is compromised when you are asked or paid to create it. I think there are other beautiful and meaningful aspects that can exist within the contest of commissioned work, but it is definitely not imbued with the same spirit of rebelliousness, conviction, spontaneity and mystery that makes street art special." "It's a bit of a touchy issue for me," he writes, but "I feel like I still have a lot to contribute in that regard." A group of Winnipeg youth set out to answer the question: How do you feel about public art?